On this date three years ago we didn’t know what to do, we were stuck on the fence as to whether we should get a BMW i3 or not. I mean totally stuck, right on the top of the fence, we were not leaning towards getting one or leaning towards not getting one. We had put in an order for a fully loaded BMW i3 – shhh, don’t tell anyone… but it was only so that we could keep the ActiveE for longer. Yes, yes I know and 3 years ago I fully owned up to it with a full disclosure. 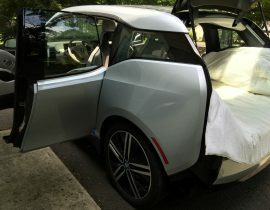 We actually had no intention of getting an i3 until “our” car popped up on Facebook at the local BMW place and we were somewhat shocked as to how good the car actually looked. It was very different from the prototype we had seen a few months earlier at BMW HQ in NJ. I mean totally different, like it could almost have been a different car altogether. After we had seen the car in person we then spent many hours going back and forth as to whether we should get the car or not. 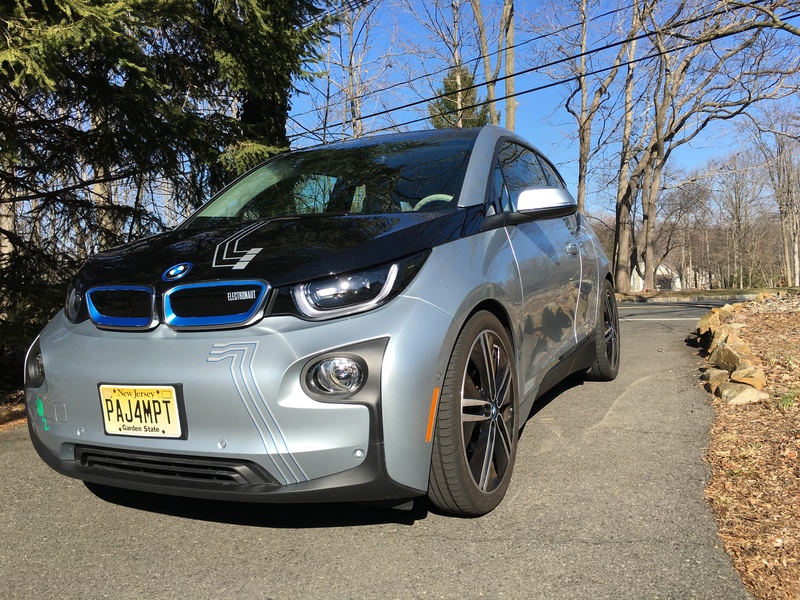 I guess it speaks for itself that we did go ahead with the purchase as here I am writing about my 3 years with our BMW i3. The last 3 years seem to have gone by very quickly, and I am now in a predicament as to what to do next. More on that later. Today, the 2nd May 2017, marks the 3 year anniversary of the BMW i3’s arrival in the US with the delivery of the first one in New England. We were joint second to get an i3 in the US with Eddie Bortell. We both received ours the following day on Saturday 3rd May 2014. 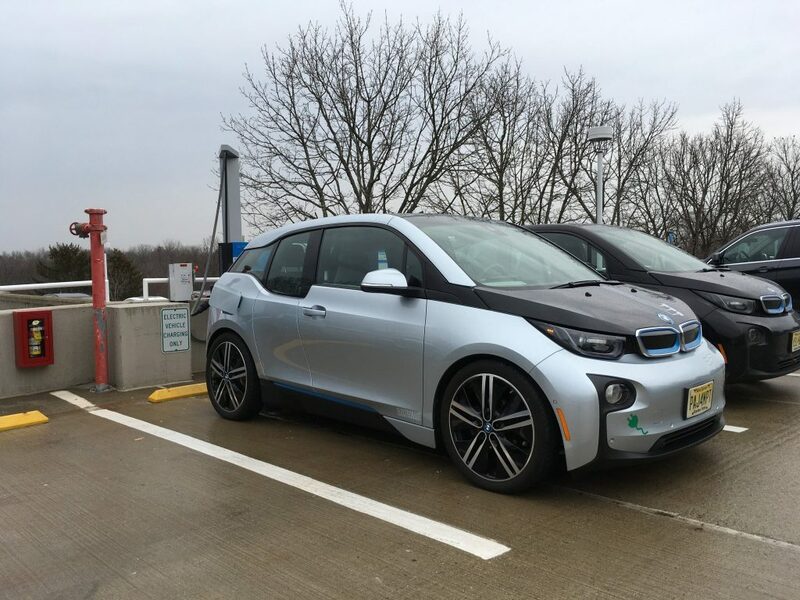 We have the first i3 in NJ and Eddie, the first i3 in NY. Some days it seems like only yesterday that we picked up the car as it still looks all shiny and new – that would be a big thank you to myself for taking such great care of it and washing it on a regular basis! The interior still looks like new too and is showing no signs of wear and tear at all. It really goes to show that if you look after your car you can keep it looking like it’s still brand new. I suppose some thanks goes to BMW for building a car fully clad in dent and ding resistant polycarbonate and for crafting the interior from some tough renewables. Three years ago, even whilst driving the i3 off the BMW forecourt, I was thinking what have we just done, did we really just take possession of a BMW i3? I have had somewhat mixed feelings about the i3 since that very first day. There are some days when I really like the car and love driving it, and then others where I think it is time to hand it back. It wasn’t until we lowered and widened the car, that it really made such a big difference to how I feel about it and of course now we are “wub, wub” free, that has made all the difference in the world. A difference that means I do, actually, rather like it the majority of the time now and I am even considering keeping it – see how minds can be changed with a few subtle changes! Which of course, it was the few subtle changes that we went for in our initial choosings (another new word I just created – it’s been a while! ), that persuaded us to get the i3 in the first place. The appearance is so much better with it lowered and we often comment on how good it looks as we walk towards it in a car park. Yep – totally vain! Personalising the car has been well worth it. It makes the car ours and gives it that uniqueness for us. It makes it look different to everyone else’s, you know just enough to be that little bit different. The stickers help too – those are a tribute to the ActiveE. We also picked the Ionic Silver Metallic exterior colour and the Mega trim interior that most others skipped over, so I feel ours is quite unique in that sense too. I’m going to say that I might, just possibly prefer silver cars – after all I do currently have three silver Electric Cars in my garage! What are my favourite things that I like about the car after 3 years? Regenerative Braking – Still one of the best features of the i3 is the amazing regen, it is the best of all the cars we currently have and have had, with the exception of the ActivE which had the same amount. I still love that I can pull up precisely to the white line without using the actual brakes. Although it still freaks me out when I go over a wet manhole cover and the regen goes off completely. Freefall!!!! Ride – With the lowered suspension and 20″ wheels the ride is a lot firmer and much better. It feels much more planted on the road and grips the corners so much better. Interior – I love the recycled Mega interior and love the fact there is no wood anywhere to be seen! I don’t have carbon fibre and aluminium in my living room and I don’t have my living room in my car. Lowered Suspension – What a difference an inch can make! Wheel Spacers – What a difference 15mm can make! And what do I dislike about the car after 3 years? Direction Selector – It has got easier to use but it’s still in a daft place and is not really very user friendly. Nooks and Crannies – There are a ridiculous amount of these that either collect grit and small stones like they are going out of fashion, or collect water in hidden spaces. It doesn’t matter how much time I spend drying the thing, it still spews water from somewhere under the door mirrors, streaking the sides of my lovely clean car… UGH! Skinny Tyres – Oh I do wish it had decent width tyres on it so it didn’t look quite so ridiculous! Wub, Wub – But we are free of that now as BMW finally owned up to the tyres being faulty! Battery Size – Now, of course I could get the new 2017 i3 which has a 33.4 kWh battery, but I like my car so much I would rather just be able to swap the battery… You know just like they can in Europe, in exchange for some cash!! I think that is all I have on my list that is worth mentioning, anything else is just little stuff. There isn’t much that troubles me about the car because it works – it really does just work. Well, we’ve been able to take the i3 on longer journeys recently as there are more and more DC Fast Charging units popping up. This at least makes a journey somewhat easier, if still a little impractical with an EPA rated 81 mile range! I would still take a trip in the i3 to Canada if I knew that the DC Fast chargers along the route were plentiful and also, all in good working order. It would be an adventure – and probably a one time adventure, as I’m not sure I’d want to do it more than once. I’m still getting great miles/kWh, I am currently at 5.3miles/kWh, it was 5.4miles/kWh until my sidekick drove it! Ugh – really must do something about that. As the weather is starting to warm up I am regularly seeing range predictions in the low 90’s and expect that to go up when the summer arrives and the temperatures rise too. We still haven’t had any major issues with the car – thank goodness – and certainly nothing that relates to it being Electric. The only issue we have had was when the seatbelt restraint warning light came on with a message to get it checked out. 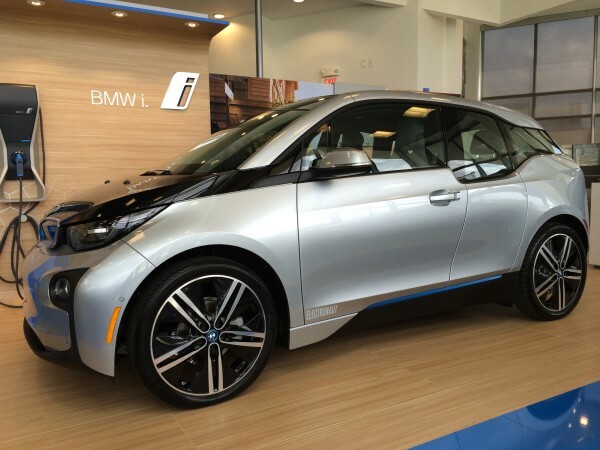 That turned out to be a sensor issue – again a BMW problem not an Electric Car one. So, back to my predicament. We have this Electric Car that really works great and hasn’t given us any real issues even though it’s a 1.0 version. After initially not really wanting the i3, then changing our minds and getting it, and now quite liking it with the changes we have made, we have a big decision to make. As we have now reached our 3rd year with the car, that means we have only 3 more months with it (39 month lease), so the question or decision is – Do we return it? Do we extend the lease? Or, do we buy it out? We’ve been thinking on this for a while now and still cannot make a decision. It’s all just too difficult!! If we return it, what do we get instead? We have a deposit for a Tesla Model 3 but we don’t know when it’ll be our turn so we need something to tide us over. If we extend the lease, do we still pay the high monthly rate that we have or is that negotiable? Extending would possibly get us to the Model 3 release date – possibly! If we decide to buy it out, then I wonder what will it be worth in another 2 or 3 years? No one has had one for long enough yet to know how well they hold up and what their value is likely to be. Will the fact that Electric Cars are coming onto the market with longer ranges mean our i3 will significantly decrease in value? Or will it be considered an antique in another 2 or 3 years time? The battery is warranted for 8 years or 100,000 miles, neither of which I am going to reach anytime soon, considering I am only at 22,555 at the moment. We took out the lease with 12,000 miles per year rather than the 7,500 we’ve actually used so, we’ve paid more and paid down on the principal quite a bit – I didn’t know 3 years ago that my mileage was going to reduce so much. Oh well!! Help me decide, what do you think we should do? 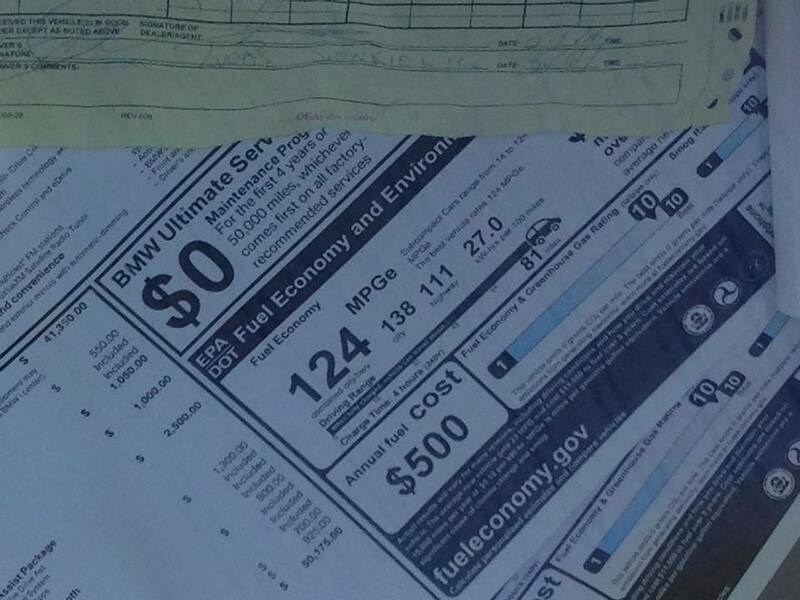 We’ve spent $24,000 on the car so far in lease payments and initial money down and we have $7,500 stashed away from the federal tax credit that’s due to BMW as part of the final balloon payment. Say goodbye? Cost: $0 – just hand over the $7,500 for the federal tax credit. Buy the car? Cost: $27,570 – Is the car worth $20,070? Here’s our thoughts on the decision to keep the car over time, now the decision is whether to stay or go. It has to be at least an 8 to stay. It’s been up and down but we’ve ended on a high!